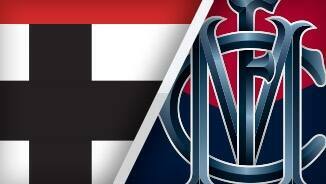 The final siren sounds and St Kilda have come out and defeated Melbourne against the odds. They have come and conquered a gallant Melbourne outfit to win by 17 points. The Saints fans begin to sing the club song upon realisation that they will record their first win of the season. Clint Jones is one shy of 40 disposals. That's well in advance of his previous career best of 35. BEHIND DEMONSVince gathers in the pocket and kicks it around the corner, but he misses to the near side. BEHIND SAINTSA behind to the Demons with St Kilda's defence rushing it through. BEHIND DEMONSSt Kilda cough up the ball deep in defence. Pedersen takes it tunnel ball style and from 10 metres out he misses an absolute sitter. 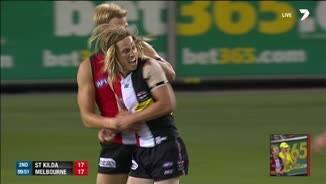 BEHIND SAINTSEli Templeton with his distinct blond locks runs inside 50 and unleashes a good looking kick. It is straightening up but hits the post. That would have been the sealer. 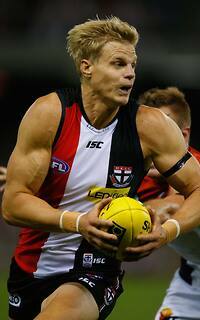 Nick Riewoldt has pulled down 10 grabs and has 20 disposals with his 3 goals tonight. Who said his best footy was behind him? He is leading by example and is an inspirational leader. There are some very tired looking players out there with some desperate contesting for the footy going on before our eyes. 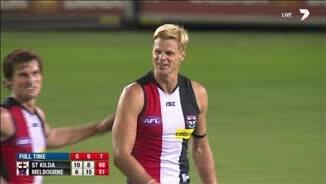 Riewoldt coming down to half back to take an uncontested mark. They are all chipping in for the Saints in Richardson's first game as coach. GOAL SAINTSSome excellent long distance kicking at goal here with Geary kicking truly from 48 metres out. St Kilda still holding up their end of the bargain here. McDonald is walking off one leg at the moment for the Dees and he simply has to go off. He cannot enter the contests and the Saints are running off him. GOAL DEMONSWe are playing a game of kick to kick with both sides taking turns kicking goals from outside 50. 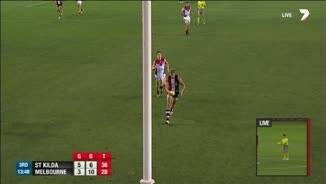 Bernie Vince announces himself as a Demon with a whopping 57 metre goal! GOAL SAINTSGwilt plays the sweeper outside 50. He has all the time in the world to send it back in. He does more than that. He kicks a mammoth goal! Shane Savage has been quiet in his first game as a Saint. He has had just the 6 possessions. BEHIND SAINTSBillings runs hard and receives the ball over the top. He runs into an open goal and kicks it into the post. GOAL DEMONSMelbourne with some good work out of the centre. Tyson gathers and unleashes a bomb from 55 metres out. Look at it go! It's through for a beauty! The final quarter is underway with this game well and truly up for grabs. The siren sounds for three quarter time with St Kilda leading by 19 points. 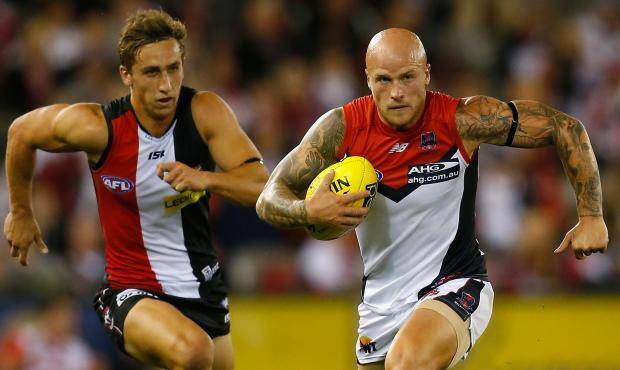 McDonald struggling with a corked thigh for the Demons. That will just continue to deteriorate as the night wears on. BEHIND DEMONSHowe tries one from distance but misses to the right. Some hard tough and passionate footy being played at the moment and the umpires are letting it go. Great stuff. The Saints forcing the Demons back and are applying the blow torch to them. The Saints are playing like winners at the moment. A familiar sight for the Demons with Nathan Jones coming up from the bottom of the pack with the ball. He is a leader and officially holds that title this season. Demons InterchangeTom McDonald off due to an injury. Welcome to Etihad Stadium for the St Kilda v Melbourne Round 1 clash. A VINTAGE third-quarter performance from St Kilda captain Nick Riewoldt has inspired the Saints to a 17-point victory over Melbourne at Etihad Stadium on Saturday night. 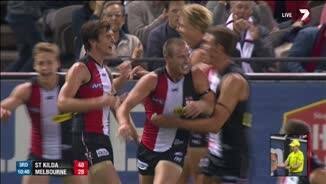 Riewoldt, possibly impatient at the prospect of the Saints' long-term plan to reach the top four by 2018, turned back the clock with a dominating term that gave his team an important first-up win. After a dour first half, the final score was 10.8 (68) to 6.15 (51) in a match that won't go down as one of 2014's best. However, it will be fondly remembered by St Kilda's Alan Richardson, who started his coaching career with a perfect record and an intriguing clash with Greater Western Sydney to come next week. 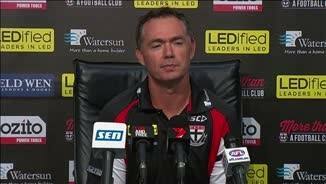 Richardson said afterwards he enjoyed the song in the rooms and watching the joy on his players' faces but admitted his personal celebration would be low-key and likely involve watching the replay. The rookie senior coach said while he entered the match without an expectation on the result, he went away pleased that the four points came with the way his players executed the game plan. "Whilst today was much more about the way we played and have the guys embrace everything that we've asked of them through pre-season in terms of the way you train, the way you prepare and then the way we were going to play, for them to get the satisfaction of the win was just a great result," Richardson said. Riewoldt was enormous in the telling third term with nine possessions, two goals and three marks after his opponent Tom McDonald began to labour heavily with a corked thigh. Amid the gritty passages of play, there were some highlights. Saints draftee Luke Dunstan's seamless start to AFL football, and Bernie Vince and Dom Tyson's work in the middle were positive introductions for both teams. Dunstan was one of the Saints' best. The 19-year-old South Australian was starting in at the centre bounce within six minutes and won five clearances for the night. Clint Jones answered the call to stand up in a depleted Saints midfield with a game-high 39 possessions. Vince ended with 28 possessions and five inside 50s, topped off with a 60m goal in the fourth quarter. Nathan Jones contributed with 38 and a huge nine clearances, despite the frequent attention of Jarryn Geary. It was the second quarter where the high-possessing Demons wasted their opportunities after leading by 14 points in the first. They blew chances inside 50, with Saints backmen Sean Dempster, Jimmy Webster and James Gwilt making life hard, and watched four unanswered goals go through at the other end for a seven-point half time deficit. 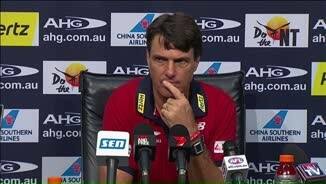 They were always going to be short in their key positions with Mark Jamar, Chris Dawes, Mitch Clark and Jesse Hogan unavailable, and their plight that was exacerbated when Jack Fitzpatrick was subbed out with concussion in the second quarter. Coach Paul Roos later acknowledged the challenge posed by the players' unavailability, despite periods where his team showed improvement. "You've got to teach them how to win and you could see there were times when we played some great footy tonight – we played really well and there were other times where you just drop off dramatically in a game," Roos said. "At times they wanted to go forward but there is just no one to kick it to so that makes it really difficult and then if you are having to go side-to-side ... you turn it over, which we did a couple of times... a lot of it was the fact there was just no one there." McDonald's corkie, which was treated in the first quarter, hampered him to the point where he could barely walk. Unfortunately for the Demons, this coincided with the game breaking open in the third quarter with the Saints' young midfield brigade climbing on top as the lead stretched to 26 points as Riewoldt took charge. 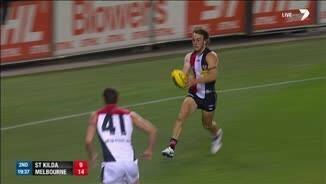 Dom Tyson's early goal in the final term gave Melbourne some short-lived hope before James Gwilt's long bomb sent the Saints fans wild and effectively sealed the game. Webster was subbed off in the third quarter for Jack Billings after becoming sore in the groin. The Saints will get Leigh Montagna and Lenny Hayes back for next week's clash with the Giants but may have to wait on Sam Fisher to get some harder training under his belt before he plays.